Budget Trees for Marvellous Forests! The well-known NOCH Hobby Series has been entirely revised in 2017 and completely re-designed. The main focus of the process was improving the quality and achieving a realistic look at favourable prices. The result speaks for itself: The cost-efficient NOCH Hobby Trees are now even more beautiful! Firs just like in the Black Forest! The cost-efficient Hobby-Trees from NOCH are ideal for creating whole forests on your model landscape. The Model Trees with their realistic tree trunks are the perfect way to design dense forests and realistic tree groupings. The trees are available in various different heights. 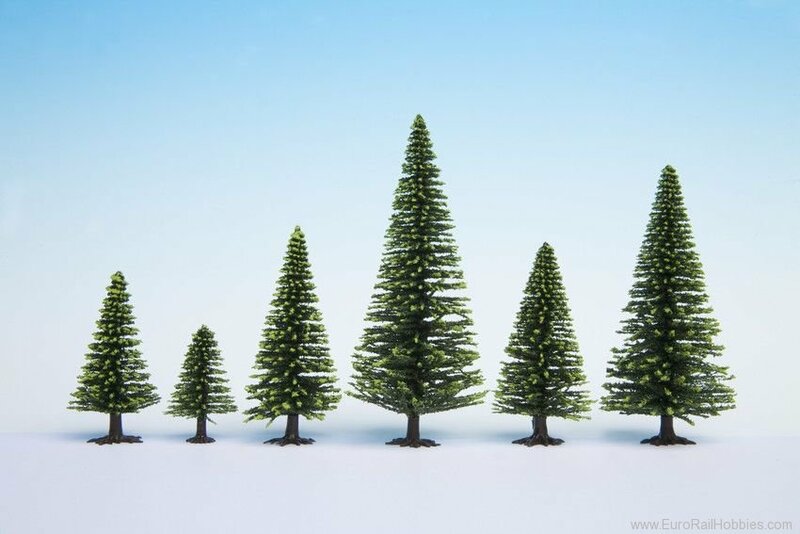 Depending on how many trees you need, the model trees are available in pack sizes of 50, 25, 10, or as little as 5 trees. The trees feature realistic, un-evenly cut tree branches and also come with realistic root stock.